Right he is, and they look like they are made to last. 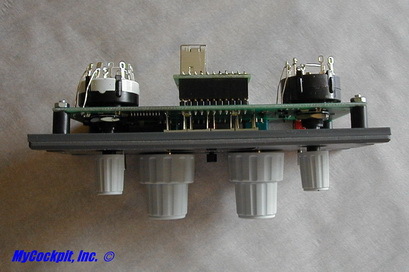 I evaluated CockpitsonicUSA (Centair) warranty and return policy, CockpitsonicUSA (Centair) is a distributor of Cockptisonic Gmbh. CockpitsonicUSA honors the warranties of Cockptisonic Gmbh. The warranty includes a 14 day of receipt of goods return policy, and warranties their products for 24 months (unless other wise noted). I think they are trying to tell you, they believe in their product. That’s an excellent indication. CockpitsonicUSA Nav and Com technical product description is similar, so I’ll combine them into one. The Nav or Com radio are plugged to your computer via USB. Background lighting is integrated. Even the test button is functional. 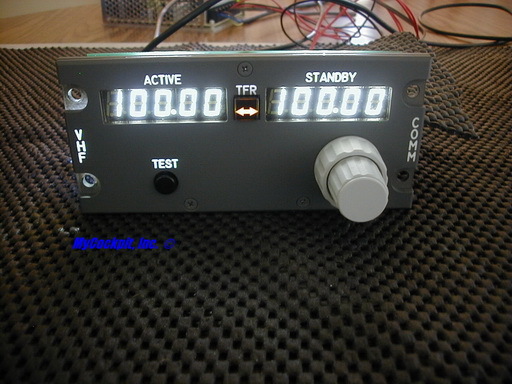 An additional 5 and 12 V power supply is required for operation and backlighting. 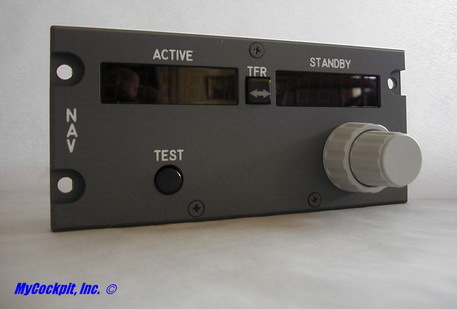 The B737 transponder comes with WHITE LED displays. 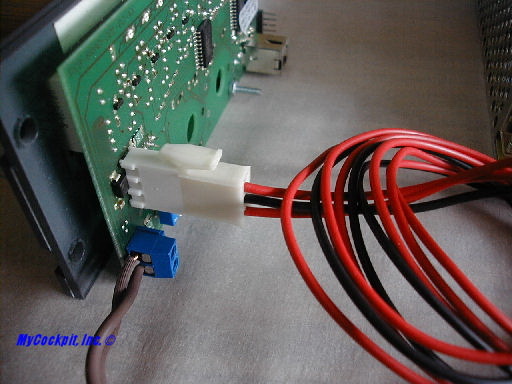 As usual you connect it via USB to your computer. The device is squawkbox compatible - this means no less then that you are able to use it for online flights. Adjustable backlighting is integrated for flights at night. 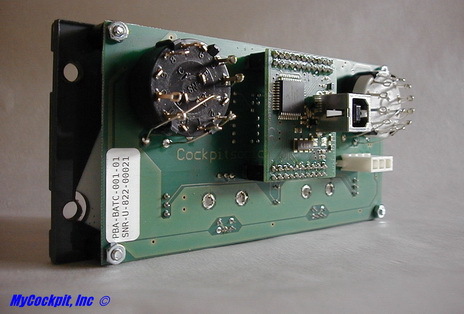 The Nav, Com and Transponder require an easy install driver, which is supplied by CockpitsonicUSA. 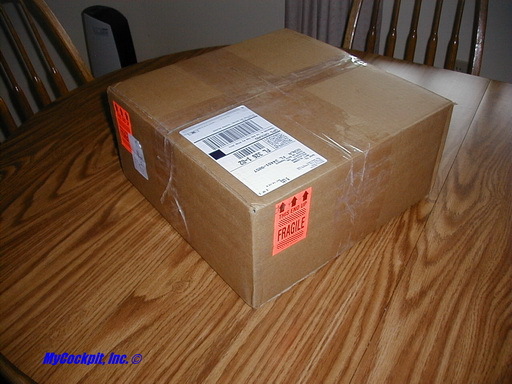 The shipment arrived on August 20th, 2008. The container was a 14X14X7 inch sturdy corrugated box, sealed with packing tape, and a job well done. The box showed no signs of damage. I used a scissors to break the seal and open the box. 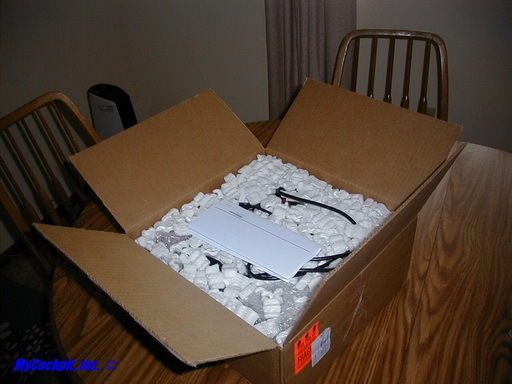 The contents were well packed using Styrofoam peanuts and individually items wrapped in bubble wrap. I thought the contents were well packaged and protected, excellent job. Removing the contents was easy. I moved the peanuts aside and pulled out bubble wrapped components. Each unit was wrapped in antistatic bags; I removed each panel from the bags, done. I looked over the units very carefully and could not find any damage or defects, perfect! 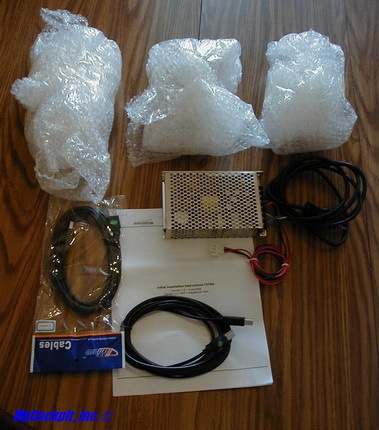 Included in the shipment, were not only the three panels, but also a D-60A Meanwell Power Supply, 5v, 12v. 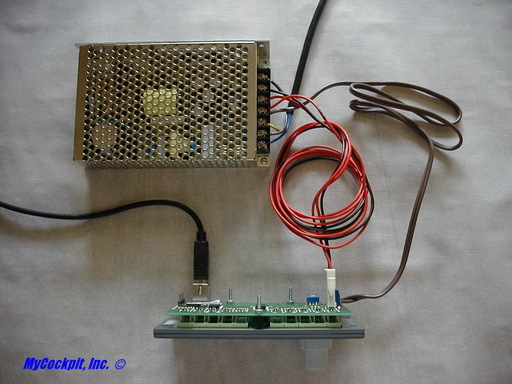 This was to supply the 5v and 12v need to operate the panels and the power cables for the panels to be connected to the power supply. 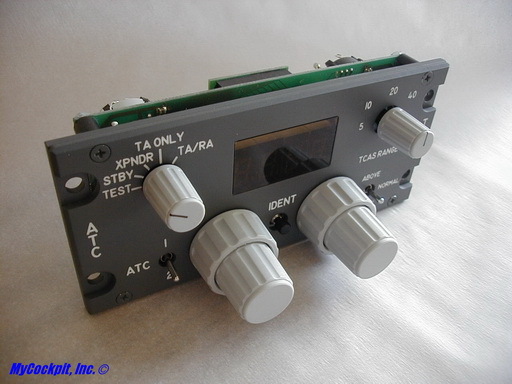 Overall the panels looked similar to the actual B737 panels, except for the dual concentric knobs, which I found to be slightly large. Otherwise, the unit was quite impressive and well built. Components looked professionally assembled, quality all the way. All switches and knobs functioned with a good tight feel that gives you the sense of durability and reliability. Now comes the fun part, I get to plug and play. First thing first; install the driver. I downloaded the latest driver from CockpitsonicUSA, ran the executable file, and “Bang”, there it was, that quick, sitting and waiting for something to be plugged in. The power unit already had the power plug connector and cord attached, so all I had to do was plug it in to the Nav radio. 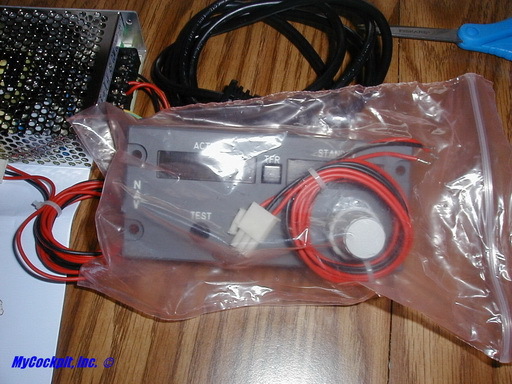 For background lighting the Nav and Com radios require a second set of wires for the 12 v from the power supply. I connected the USB to the computer and Nav unit; it was immediately detected by the driver program. The driver program allows you to test the lighting of the unit. So, a testing we will go. To the right is the nav panel without any lights on. I first tested the lighting for daytime. I was surprised how much light came from those tiny led’s attached the CB, then tested the 7 seg led’s, they are nice and bright. No problem seeing these lit during the day. To the right is the Com panel with lights on for daytime. Now for the night time lighting; I darkened the room and dimmed the lights on the panels, and WOW, that looks good. I would want this in my cockpit. 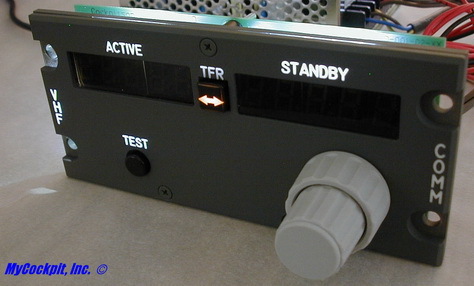 To the left is the Transponder panel with night time lighting. So what’s next….. Start up MS FS9 of course. Well at this point I’ve got to tell you, it doesn’t get any easier. No matter what aircraft I used, from a C172 to B747, oh, and even an Airbus, the panels worked flawlessly. I had the same experience using MS FSX. Now that is truly what I call Plug & Play. What do I LIKE about this product: First and foremost is the simplicity of getting it up and running. I’ve spent thousands of hours of building my own sim and wiring panels. 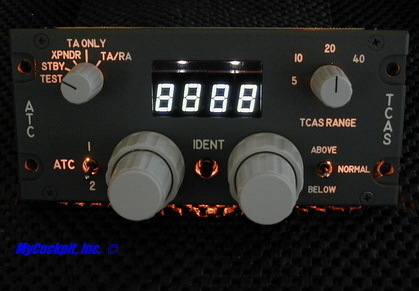 $300 USD for CockpitsonicUSA Nav or Com panel, I’d buy it in a heart beat. I love the warranty, it tells me a lot about how CockpitsonicUSA stands behind their product, and the 24-month warranty is excellent. The lighting is fantastic, easy to see panels in a dark cockpit. Dislikes: I mentioned the knobs before, may be it’s just me, getting particular in my old age. They’re not that much bigger, I guess. Ok, besides the knobs, I was a bit disappointed in the documentation. It could be more specific and easier to read. I looked these units over very carefully, and am so impressed how well they are put together. The encoders have a nice rugged feel to them, like the real thing. I took a lot of pictures, because I want you to see for your self the quality that has been put into these panels. If I was building a Boeing, I would definitely buy these panels. The warranty is fantastic; it assures me of reliability and quality workmanship. I want to thank Manolo Centeno of CockpitsonicUSA, to offer a quality product to our flight-sim builders. I also want to thank him for giving me the opportunity to review this product and share this information with my fellow flight-sim builders.